more than what was in their musical endeavours. 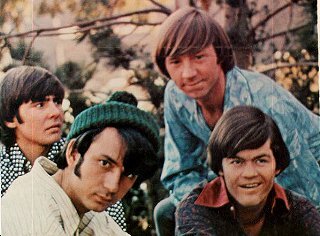 This essay will show each Monkee's history, and contribution to the group. Micky was born and raised in the geographical area of Burbank, CA. The Monkees gives Micky not much time to master his knowledge of science. It is all in his gray matter, but rarely tested and perfected. because he seems to not want to learn. in singing and dancing. He played guitar for a bit to broaden his talents. in order to have Davy "around". It is a father-male daughter relationship. Mike grew up in the backwoods of Texas. He was the oldest of ten children. He helped take care of the other children, and also helped around the house. and what it had to offer. He left Texas to his parents dismay. but has a hard time hanging out with Peter. somehow convinced Mike that Peter could be an assest to the band. will never reach. However, he follows Mike's advice as best as he can. is, so he knows the best way to correct Peter. © E.T. Lee, 1999, except graphic. Disclaimer: The characters and individuals portrayed and the names used herein are fictitious and any similarity to the same characters or history is coincidental and unintentional. Back to the start of it all! !